1. The Gray Havens make incredible music. And even though their albums are masterfully produced, their live performances are A-MAZ-ING! 2. Their latest release She Waits is jaw-droppingly good. The UTR Critics just named it one of the Top 11 Gourmet Albums of 2018. 3. 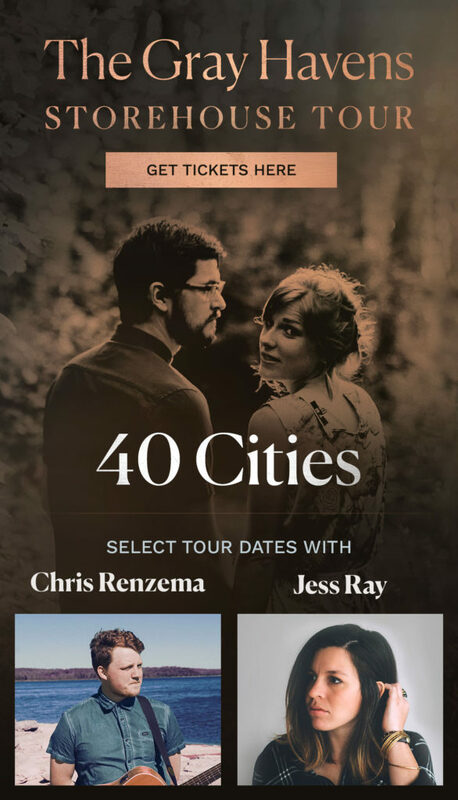 Nearly all tour stops will have the support of one of these two openers: Chris Renzema or Jess Ray – two indie artists who we adore. 4. It’s very likely coming to a city near you. The tour spans over 2 months and will visit approximately 40 cities. The full list of confirmed dates and cities is below. 5. Avoid FOMO. The only way to guarantee you won’t be gripped by the fear of missing out is if you get your tickets now. Get ready for incredible music memories!